If this is a Truck Shipment; for the shipping cost shown you must be able to unload the items at the delivery point. The drop down menu on the order page lists additional delivery options and services and their cost if any. 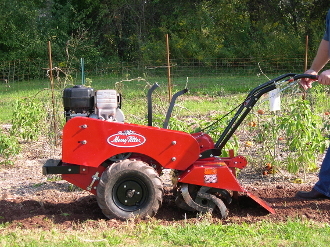 The rear tine model is a strong, durable, and easy to use rear tine tiller that is self-propelled with three forward gears (two for tilling) and a reverse gear. Engine warranty is covered by the respective engine manufacturers and is as follows: 2 years for consumer use and 1 year for commercial use on the 13.5 hp Briggs And Stratton Engine; 3 year limited on the Robin Engine; and 2 years limited on the Honda Engine.